When I think of a good, classic sub sandwich, the picture above comes to mind. I call this an Italian sub. I know people have their own definitions of exactly what an Italian sub should made out of, but this is what I go with and it is everything I want in a sandwich and more. I give it the Italian moniker because it has salami, capicola, and provolone making up most of the main body (don't forget about the homemade roll). Add lettuce, tomato and onion for flavor and crunch. The vinegar, herbs, garlic, and oil dance around the edges of all that yumminess for a can't go wrong "sammich" that is sure to satisfy for a game day or any day. A few potato chips and some hot pepperoncini on the side-- score! *Note-- Below is the amount and type of meat that I like to use, but feel free to use the meats according to your own taste, as well as the amount. In a squeeze bottle combine the oil, vinegar, parsley, garlic, oregano, and basil by shaking vigorously (make sure the tip is capped or your finger is placed over the opening before shaking). Season to taste with salt and pepper; set aside. Squeeze some of the vinaigrette into each roll. Layer the cheese, meats and veggies into each roll, squeeze more dressing onto the top of the sandwich. Enjoy! Now I need an Italian. Get in my mouth now! You just totally made my day. 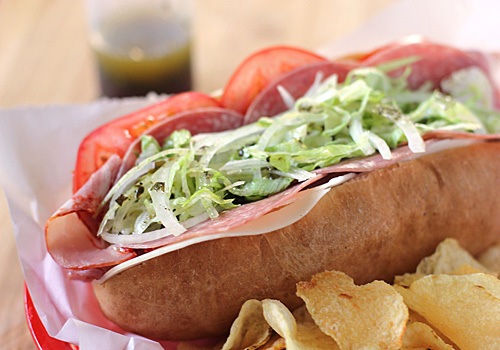 A few days ago I was scouring the internet for an awesome italian hoagie recipe. I signed onto tastespotting.com today and your sandwich came up in the new recipes section! Awesome. Can't wait to try this out. What a fabulous looking sandwich, it sounds so delicious! That dressing recipe is amazing! Really tangy and garlicky.